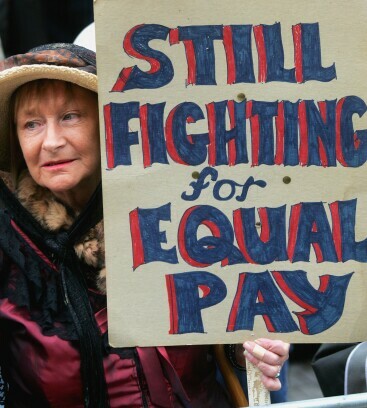 A protestor holds a poster supporting equal pay. The Office of Management and Budget says pay data advocates don’t have the right to sue the agency over its decision to stall the EEOC’s attempts to collect employers’ pay data. The case brought against the OMB by the National Women’s Law Center and the Labor Council for Latin American Advancement should be tossed out of court, the agency said in a Feb. 13 motion. The two groups don’t have the right to sue the OMB for stalling the pay data rule because neither have been directly affected by the OMB’s decision, the agency said in court documents. The OMB also said its decision to stay pay data collection was legal under federal law. Collecting pay data from employers has been a hot topic the past several years. The Labor Department in 2014 proposed collecting pay data from federal contractors. That proposal eventually became part of the EEOC’s 2016 decision to change employer surveys to address pay inequity. The OMB blocked that effort in August because it said the data collection would be too burdensome for businesses. The NWLC plans to keep up its legal battle against the OMB, Emily Martin, vice president for workplace justice at the NWLC, told Bloomberg Law. “The Trump Administration is attempting to keep us out of court on these threshold questions that do not go to the merits of our claim, because they know the Trump Administration’s rollback of equal pay data collection was illegal and indefensible,” she wrote in an email. Neither the OMB nor the attorney representing the office replied to requests for comment. Pay equity has become a bipartisan issue since the #MeToo movement, which means the government needs to revisit it at some point, David Cohen said. Cohen is president of DCI Consulting Group in Washington and advises employers on how to comply with EEOC and Labor Department regulations. “At some point they will have to decide will they let it die on the vine or do they take another run at it by making significant modifications,” Cohen wrote in an email. The two advocacy groups filed the lawsuit Nov. 15 in the U.S. District Court for the District of Columbia. The case is Nat’l Women’s Law Ctr. v. OMB, D.D.C., No. 1:17-cv-02458, motion to dismiss filed 2/13/18.